Drinking • Designed to look like the original Harley Davidson factory, Strap Tank is ready to become Utah County's first modern-day brewery. 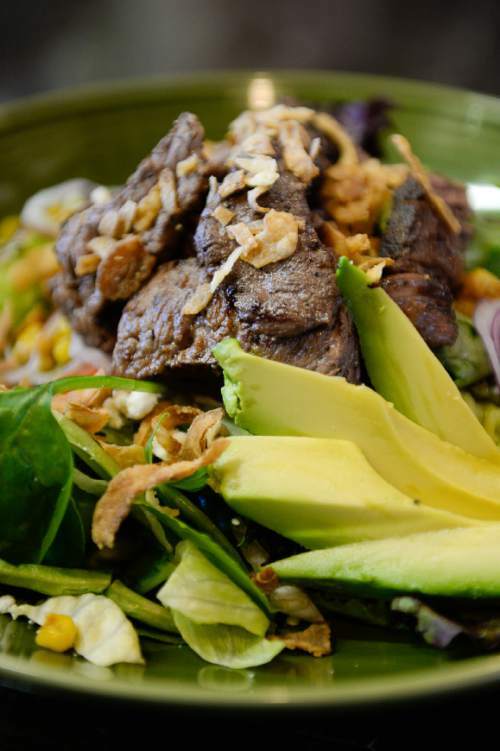 Francisco Kjolseth | The Salt Lake Tribune The Steak Salad at Strap Tank Brewing, which will be Utah County's first modern-day brewery as soon as it gets its manufacturing license from the DABC, which is expected to happen Tuesday, June 28. 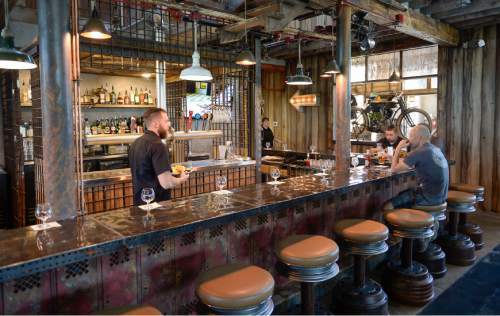 Until then, Strap Tank is operating as a restaurant and bar. 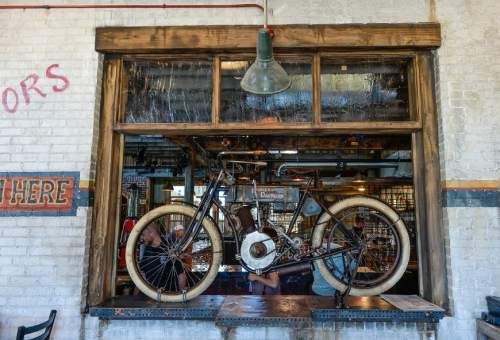 Francisco Kjolseth | The Salt Lake Tribune A replica of the 1907 Strap Tank Harley Davidson at the motorcycle-themed Strap Tank Brewing in Springville. Only three of the actual bikes are known to exist. Across the street in a motorcycle museum is the real thing owned by Rick Salisbury, who is the owner of the brewery. Francisco Kjolseth | The Salt Lake Tribune Strap Tank Brewing in Springville will be Utah County's first modern-day brewery as soon as it gets its manufacturing license from the DABC, which is expected on Tuesday, June 28. Strap Tank is already operating as a restaurant and bar. The building is patterned after the original Harley Davidson factory in Milwaukee, and is named after the company's 1907 Strap Tank motorcycle. Francisco Kjolseth | The Salt Lake Tribune Strap Tank Brewing in Springville will be Utah County's first modern-day brewery as soon as it gets its manufacturing license from the DABC, which is expected on Tuesday, June 28. Strap Tank is already operating as a restaurant and bar. The building is patterned after the original Harley Davidson factory in Milwaukee, and is named after the company's 1907 Strap Tank motorcycle. 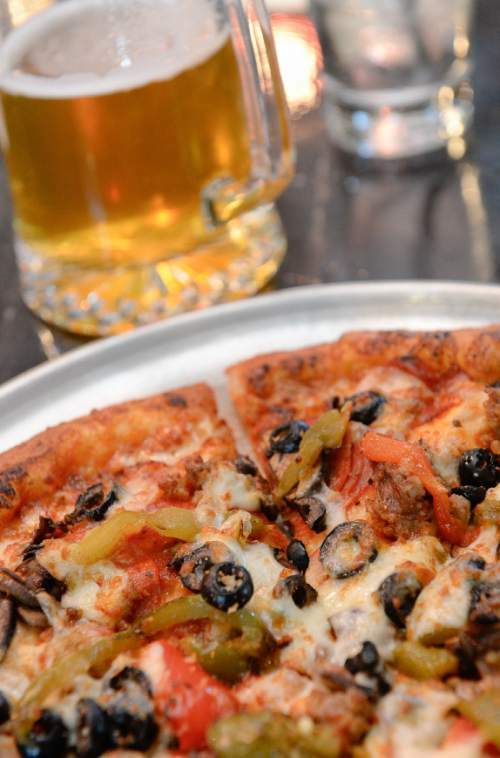 Francisco Kjolseth | The Salt Lake Tribune The Supreme Pizza at Strap Tank Brewing in Springville. Francisco Kjolseth | The Salt Lake Tribune Strap Tank Brewing will be Utah County's first modern-day brewery. 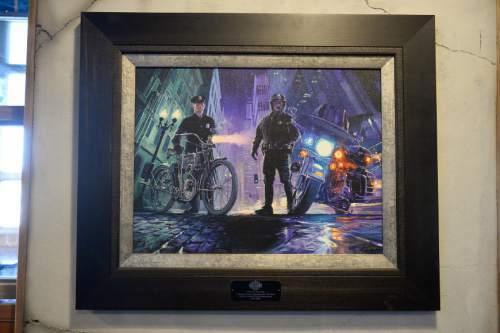 The building, patterned after the original Harley Davidson factory in Milwaukee, named after the company's 1907 Strap Tank motorcycle, features extensive motorcycle-themed art work around the restaurant. Francisco Kjolseth | The Salt Lake Tribune Strap Tank Brewing will be Utah County's first modern-day brewery as soon as it gets its manufacturing license from the DABC, which is expected on Tuesday, June 28. Until it can brew on site, Strap Tank is operating as a restaurant/bar and making do with a collaboration beer that head brewer Mike Dymowski made with Salt Lake City's Proper Brewing. The pale ale, called "Properly Tanked," is available on tap and so far has been the best seller. Francisco Kjolseth | The Salt Lake Tribune Strap Tank Brewing will be Utah County's first modern-day brewery as soon as it gets its manufacturing license from the DABC, which is expected on Tuesday, June 28. Until it can brew on site, Strap Tank is operating as a restaurant/bar and making do with a collaboration beer that head brewer Mike Dymowski made with Salt Lake City's Proper Brewing. The pale ale, called "Properly Tanked," is available on tap and so far has been the best seller. Francisco Kjolseth | The Salt Lake Tribune Strap Tank Brewing will be Utah County's first modern-day brewery as soon as it gets its manufacturing license from the DABC, which is expected on Tuesday, June 28. Until it can brew on site, Strap Tank is operating as a restaurant/bar and making do with a collaboration beer that head brewer Mike Dymowski made with Salt Lake City's Proper Brewing. The pale ale, called "Properly Tanked," is available on tap and so far has been the best seller. Francisco Kjolseth | The Salt Lake Tribune Strap Tank Brewing will be Utah County's first modern-day brewery as soon as it gets its manufacturing license from the DABC, which is expected on Tuesday, June 28. Until it can brew on site, Strap Tank is operating as a restaurant/bar and making do with a collaboration beer that head brewer Mike Dymowski made with Salt Lake City's Proper Brewing. The pale ale, called "Properly Tanked," is available on tap and so far has been the best seller. Francisco Kjolseth | The Salt Lake Tribune Strap Tank Brewing will be Utah County's first modern-day brewery as soon as it gets its manufacturing license from the DABC, which is expected on Tuesday, June 28. Until it can brew on site, Strap Tank is operating as a restaurant/bar and making do with a collaboration beer that head brewer Mike Dymowski made with Salt Lake City's Proper Brewing. The pale ale, called "Properly Tanked," pictured, is available on tap and so far has been the best seller. 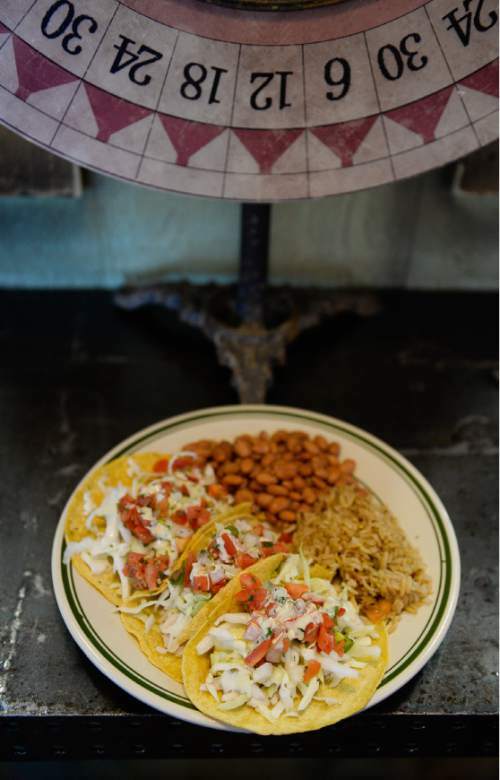 Francisco Kjolseth | The Salt Lake Tribune The Strap Tank Tacos at Strap Tank Brewing, Utah County's first modern-day brewery as soon as it gets its manufacturing license from the DABC, which is expected to happen Tuesday, June 28. Francisco Kjolseth | The Salt Lake Tribune Strap Tank Brewing will be Utah County's first modern-day brewery as soon as it gets its manufacturing license from the DABC, which is expected to happen on Tuesday, June 28. Until it can brew on site, Strap Tank is operating as a restaurant and bar and making do with a collaboration beer that head brewer Mike Dymowski, pictured, made with Salt Lake City's Proper Brewing. The pale ale, called "Properly Tanked," is available on tap and so far has been the best seller. Francisco Kjolseth | The Salt Lake Tribune Strap Tank Brewing will be Utah County's first modern-day brewery as soon as it gets its manufacturing license from the DABC, which is expected on Tuesday, June 28. Until it can brew on site, Strap Tank is operating as a restaurant/bar and making do with a collaboration beer that head brewer Mike Dymowski made with Salt Lake City's Proper Brewing. The pale ale, called "Properly Tanked," is available on tap and so far has been the best seller. Springville • Utah County has been living through a spirited drought for nearly a century, with no legal beer brewers operating within its borders since before Prohibition. 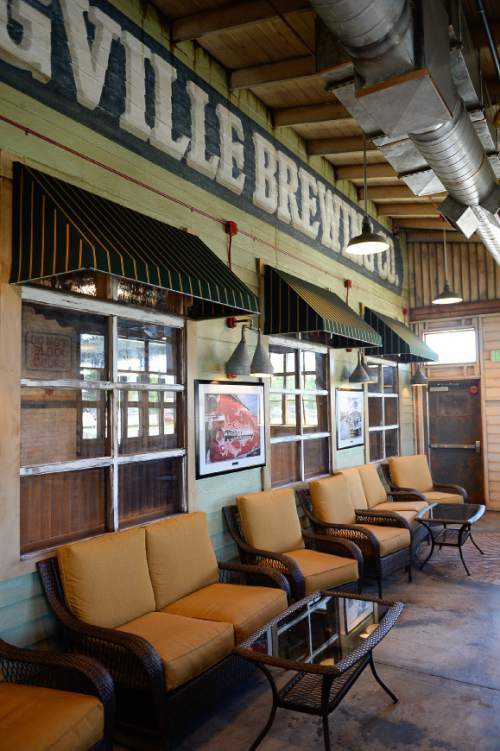 The dry spell could change next week, when the Utah Department of Alcoholic Beverage Control Commission is expected to grant Springville&apos;s new Strap Tank Brewing Co. a manufacturing license. While many Utah County residents  mostly Mormons who abstain from alcohol  never thought a modern-day brewery would come to the area, others welcome the addition, saying it was inevitable as the state&apos;s population becomes more diverse and the craft beer movement continues to explode in Utah and the rest of the nation. "A lot of people might be disappointed thinking the heathens have arrived," joked Mapleton resident Craig Wiley, who was born and raised in Springville and was dining recently at the brewery. "But we&apos;ve grown up enough, so it&apos;s time," he said, comparing the area to a teenager moving into adulthood. Still, when restaurant consultant Joe Lambert was approached about helping launch a brewery in one of Utah&apos;s most conservative communities, everyone told him to run in the opposite direction. "A brewery in Utah County seemed like an oxymoron," said Lambert, who was formerly the president of Salt Lake Brewing Company. But the multimillion-dollar project involved Utah County home builder Rick Salisbury. 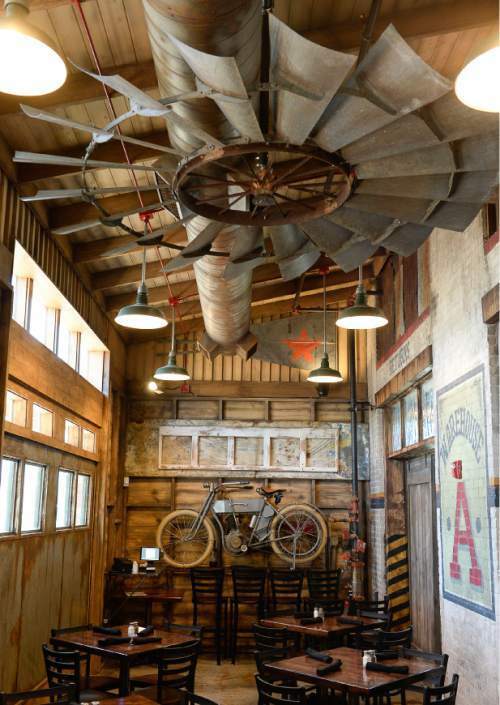 The owner of Salisbury Homes wanted his passion for vintage motorcycles to be the restaurant and brew pub&apos;s overriding theme. 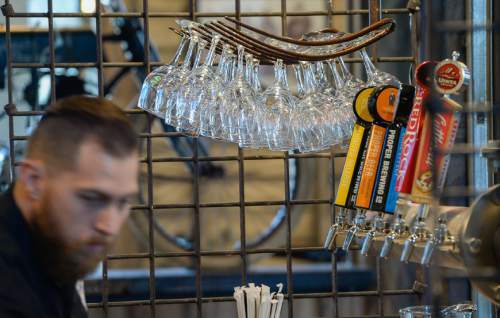 Built on the same property as Legend&apos;s Vintage Motorcycles, which Salisbury also owns, the brewery is designed to look like the original Harley Davidson motorcycle factory in Milwaukee. 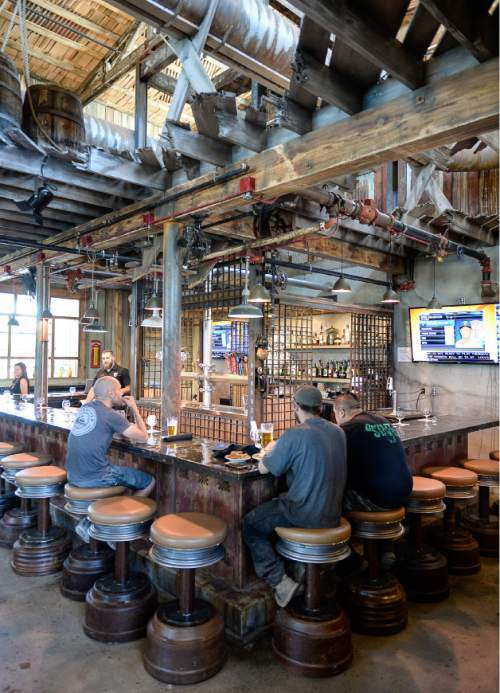 From the smokestack and vintage-looking red bricks on the outside of the brewery to the wood beams and concrete floor on the inside, "everything is brand new, but is made to look old," said general manager J.D. McColgan. He fondly called Salisbury a "junker" who delights in finding old items  everything from rusted tire rims to dilapidated furnaces  and turning them into art. 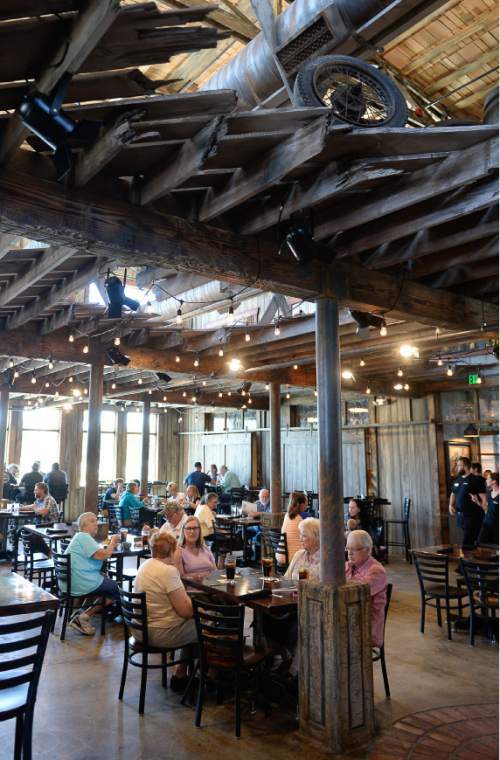 "There&apos;s just as much craft in the building as there is in the food and the beer," said McColgan, as he pointed out the metal bar, made from a World War II landing strip. 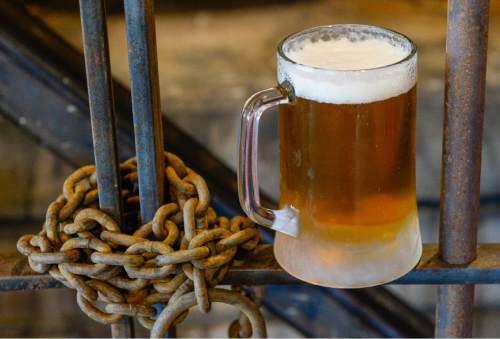 Even the brewery&apos;s name is a nod to one of Harley Davidson&apos;s earliest motorcycles. Only three of the vintage Strap Tank motorcycles still exist, and Salisbury owns one. Built in 1907, it is on display at Legends Vintage Motorcycles; a replica made from found parts greets guests as they enter the brewery. While Strap Tank will soon be able to claim the title of Utah County&apos;s first modern-day brewery, it&apos;s not the first time ales and lagers will have been made in the region, said Del Vance, author of "Beer in the Beehive." 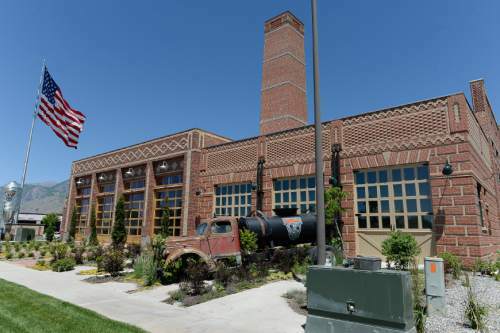 While researching Utah&apos;s beer-brewing history for his book, Vance said he found records of a brewery in the Provo area that began operations in 1873, but closed after a fire in 1877. Not much else is known about it. "It&apos;s like they didn&apos;t want anyone to know about the sinners of &apos;Happy Valley,&apos; " he said, noting that it probably was a small operation. Bigger breweries before Prohibition were near mining towns that attracted immigrant workers from Germany, Ireland and other beer-drinking countries of Europe. Strap Tank Brewing had hoped to get its manufacturing license in late May, which would have allowed head brewer Mike Dymowski to have beer on tap in time for the June 11 grand opening. But a snafu with the business license  which is required before DABC approval  pushed things back 30 days. Strap Tank was still able to open as a dining club, which allows minors in the establishment when accompanied by someone 21 or older. Guests have been able to enjoy its traditional pub fare: salads, sandwiches, hamburgers, pizza, fish and chips, and prime rib. Beer is available on tap, but it&apos;s mostly from other breweries. Dymowski has been making the best of the situation, testing and retesting the brewing tanks and fermenters, and taking advantage of an offer by Salt Lake City&apos;s Proper Brewing to create a collaboration beer. The resulting pale ale, called Properly Tanked, is available on tap at Strap Tank and so far has been the best seller. Once Strap Tank starts manufacturing, Dymowski plans to create four core beers for the brewery: a session IPA, a light lager, a red California common and a dry Irish stout. 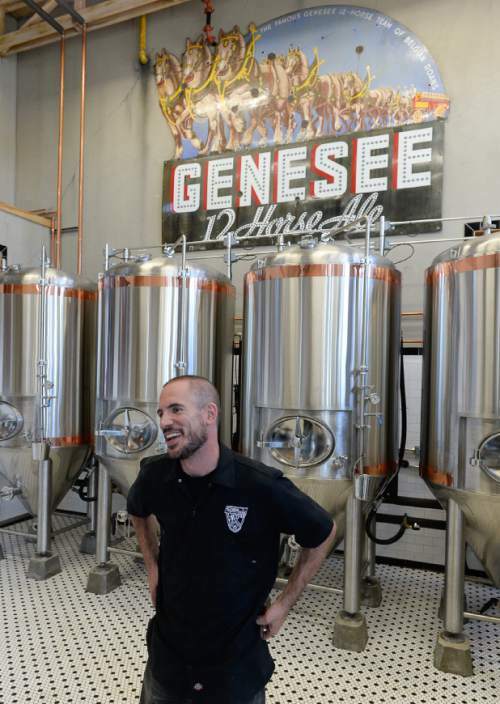 The brews, all 4 percent alcohol by volume, will be available on tap in mid-to-late July, he said. Elizabeth Westenburg, who stopped in with co-workers last week for lunch, is eagerly awaiting the day when Strap Tank is running at full strength. "I haven&apos;t stopped thinking about it," said the Provo resident, who grew up in Las Vegas. "It will be nice to have a place that is open after 9 p.m. and where you can hang out with friends, relax and have a beer." Stap Tank Brewing Co., which opened earlier this month, is expected to get a state manufacturing license, making it the first modern-day brewery in Utah County. Hours • Monday-Thursday, 11 a.m.-10 p.m.; Friday, 11 a.m.- 11 p.m.; Saturday, 10:30 a.m. -11 p.m.; and Sunday, 10:30 a.m.- 10 p.m.